On Saturday, December 9, 2017, the anniversary date of the adoption of the 1948 Convention for the Prevention and Punishment of the Crime of Genocide, the Auschwitz Institute for Peace and Reconciliation (AIPR) participated in a conference organized by the Elie Wiesel Network of the European Grassroots Anti-Racist Movement (EGAM), The Armenian General Benevolent Union (AGBU)-Europe, and the Nouvelles d’Arménie magazine, entitled “How to Stop the Killing”. 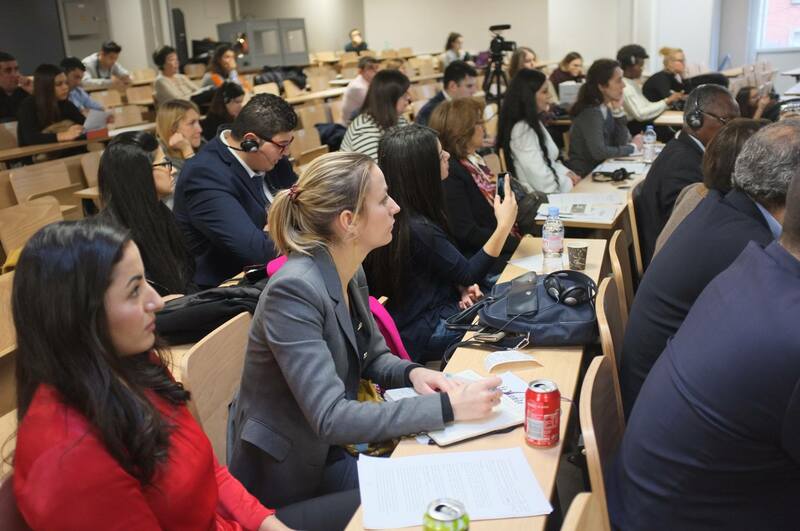 The event, held at the Paris School of Business, was convened with the objective of reviewing the lessons policy-makers have learned from experiences over the past decades and examining new ways in which governments and international organizations can anticipate and prevent future massacres and ethnic cleansing. The conference was attended by a wide range of actors in the field of mass atrocity prevention, ranging from members of civil society and academia as well as conflict resolution professionals and students from the host institution. Three panels were held throughout the day covering different themes under the topic of atrocity prevention and Europe. Panel contributions came from leaders in civil society and legal experts from the Yazidi community, Syria, the Central African Republic, as well as a member of European Parliament, and a UNESCO Ambassador. 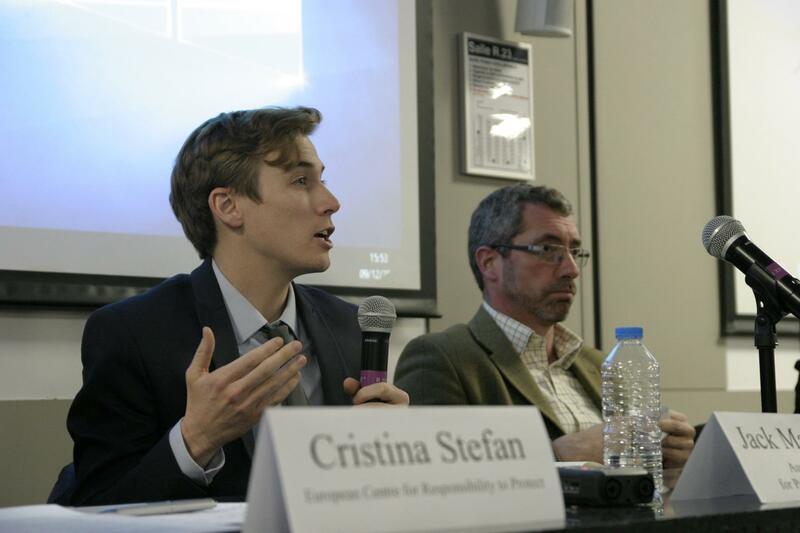 Representing the Auschwitz Institute, Jack Mayerhofer, Chief of Staff, participated in the event’s first thematic discussion panel titled “What is Europe Doing to Stop the Killing?” which was moderated by Nicolas Tavitian. In addition to Mr. Mayerhofer, the panel was comprised of Frank Engel, Member of European Parliament from Luxembourg and Dr. Cristina Stefan, lecturer in International Relations at the University of Leeds and Co-Director of the European Centre for Responsibility to Protect (ECR2P). For his part, Mr. Mayerhofer discussed the capacity of national governments to address early warning signs and risk factors for mass atrocities and some of the ways that they have capitalized on these capacities to turn them into effective preventive action. He emphasized the advantages of early action on the part of governments, noting that the range of available tools shrinks the longer action is delayed. Mr. Mayerhofer also highlighted the successes found in the implementation of policies and practices that promote early action, such as national mechanisms for the prevention of genocide and other atrocity crimes and national participation in regional networks such as the Latin American Network for Genocide and Mass Atrocity Prevention and the nascent African Network for Genocide and Mass Atrocity Prevention. The conference included two subsequent discussion panels. The first, titled “Where is Action Needed Today?” was moderated by Christopher Metz. Mr. Metz was joined by Delkhwaz Haciy, Director of Yazda – Global Yazidi Organization, Godefroy Mokamanede from the Interreligious Platform in the Central African Republic, and Almoutassim Al Kilani from the Syrian Centre for Media. The final discussion panel, “How to Place ‘Responsibility To Protect’ at the Heart of EU Policies,” was moderated by Ara Toranian and comprised of Beate Klarsfeld, UNESCO Ambassador for Genocide Prevention, Benjamin Abtan, Coordinator of the Elie Wiesel Network of Parliamentarians of Europe involved in preventing genocide and mass atrocities and fighting against genocide denial, and Nadia Gortzounian, President of AGBU-Europe. A video recording of the event can be found on the European Grassroots Anti-Racist Movement Facebook page. For more information about how the Auschwitz Institute for Peace and Reconciliation is supporting the work of governments, please visit the Africa Programs and Latin American Program pages of our website.